Water plays a major role for our planet not only in its liquid form at the surface. In the atmosphere too, it considerably affects our lives as well as weather and climate. Clouds and rainfall are one example. Water vapor, the gaseous form of water, also plays a prominent role on Earth. It is the most important greenhouse gas in the atmosphere, without it the Earth would be a frozen planet. For climate variations, water vapor is particularly important in the stratosphere at altitudes between 15 and 50 kilometers. 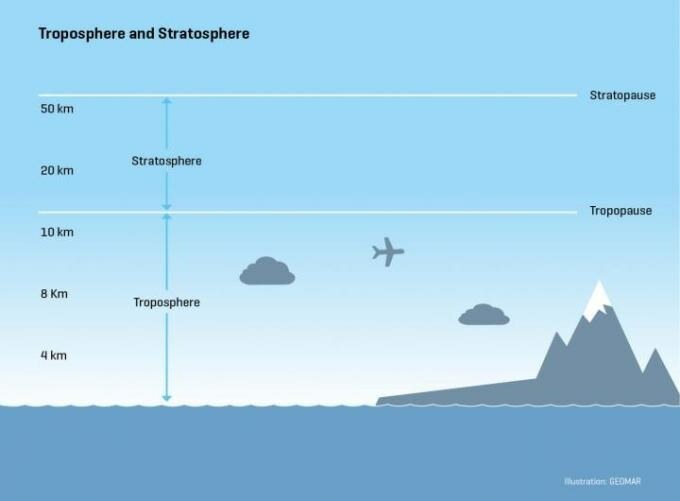 How much of the gas actually reaches the stratosphere mainly depends on the temperature at the transition between the lowest atmospheric layer, the troposphere, and the overlying stratosphere. This boundary layer is called the tropopause. Now scientists of the GEOMAR Helmholtz Centre for Ocean Research Kiel, together with a colleague from Bergen (Norway), were able to demonstrate for the first time that natural fluctuations in water temperatures of the Pacific - which occur on decadal timescales - are directly related to the temperature of the tropical tropopause. "It has long been thought that human influences already affected the tropopause. However, it seems that natural variability is still the dominating factor," says Dr. Wuke Wang from GEOMAR, lead author of the study just published in the international journal Scientific Reports. For their study, the researchers used observations for the period 1979-2013 and also climate models. "We were thus able to extend the study period to nearly 150 years. The model allows us to easily look at both human and natural influences and to separate their impacts from each other," explains Prof. Dr. Katja Matthes, climate researcher at GEOMAR and co-author of the study. A well-known climatic phenomenon is the so-called Pacific Decadal Oscillation (PDO). "This natural variation with decadal timescale leads to anomalously high or low water temperatures of the Pacific," explained Dr. Wang. The PDO influences the climate and ecosystems in the Pacific region and also the global mean temperature of the Earth. The model simulations show that the fluctuations in water temperatures also affect the wind systems over the tropical and subtropical Pacific. This in turn also alters the air transport between the lower and upper layers of the troposphere, ultimately regulating the temperatures at the boundary to the stratosphere. "We were now able to demonstrate these relationships for the first time," said Dr. Wang. Thus, the current study contradicts earlier hypotheses about the temperature variability of the tropical tropopause. As early as in the late 20th century, scientists had seen a cooling trend there which began in the 1970s. They traced this observation back to anthropogenic causes, in particular the increase in greenhouse gases. "However, this assumption was based on a rather patchy data base and simplified climate models. Our study shows that the cooling of the tropical tropopause does not have to be a one-way street but could also be part of a natural fluctuation which extends over several decades," Professor Matthes emphasized. This knowledge is also of paramount importance for the general climate research. The temperature of the tropopause decides on the input of water vapor into the stratosphere: The higher the water vapor content in the stratosphere, the higher the increase in surface temperatures. Anthropogenic climate change also has an effect on the temperature of the tropopause, and this effect could become more evident in the coming decades. "Only if we can clearly distinguish natural variability from anthropogenic influences, we can make reliable forecasts for the future development of our climate," Prof. Matthes summarizes.